Three International Space Station crew members from Russia, Italy and the U.S. are on the verge of closing out a four-and-a-half month space flight, set for a parachute-and-rocket-assisted touchdown in the Kazakh steppe on Thursday aboard their Soyuz MS-05 spacecraft. Sergey Ryazanskiy of Roscosmos, ESA’s Paolo Nespoli and NASA Astronaut Randy Bresnik have finished preparations for their homecoming after 138 days aboard the Space Station and are ready to depart the complex Wednesday night for a brief free-flight ahead of a rocket-powered braking maneuver to set the stage for landing in frigid weather with temperatures expected below -10° Celsius in the designated landing area in south-central Kazakhstan – a stark contrast to the crew’s last contact with Earth’s climate when departing on a warm summer night. 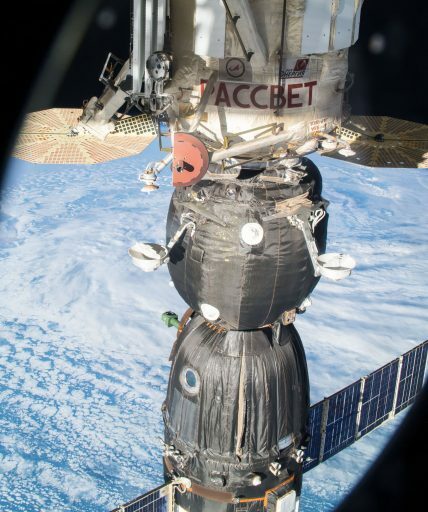 The crew’s return will begin with the closure of the hatches between the Soyuz capsule and the International Space Station at 2:00 UTC on Thursday morning that will set in motion the final preparatory steps for the spring-loaded undocking of the seven-metric ton spacecraft at 5:14 UTC. Drifting away from the International Space Station, Soyuz will fire its engines to speed up its departure and, over the course of one and a half laps around Earth, open up a sufficient gap for the deorbit burn – a 4.5-minute braking maneuver planned at 7:44 UTC to place the spacecraft on a downward arc intercepting the atmosphere over the Middle East for a blazing re-entry. 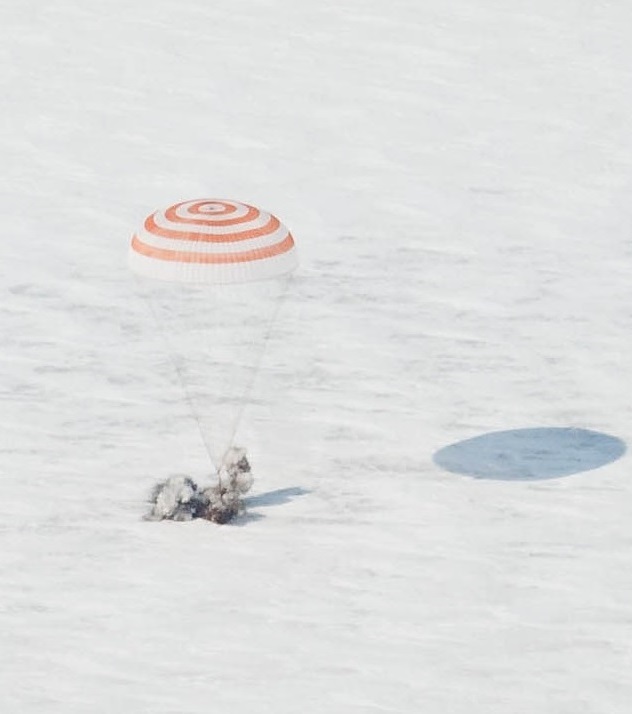 Suspended under its large orange-and-white main chute, Soyuz is planned to touch down at 8:38 UTC near the remote town of Zhezkazgan after a mission of 138 days and 16 hours. Soyuz MS-05, the 134th mission of a Soyuz spacecraft, lifted off from Kazakhstan’s Baikonur Cosmodrome in the evening hours of July 28 after a month-long delay due to a technical problem on an earlier Soyuz mission that necessitated a swap between Soyuz vehicles and caused delays to subsequent missions that had to wait for spacecraft to finish production. 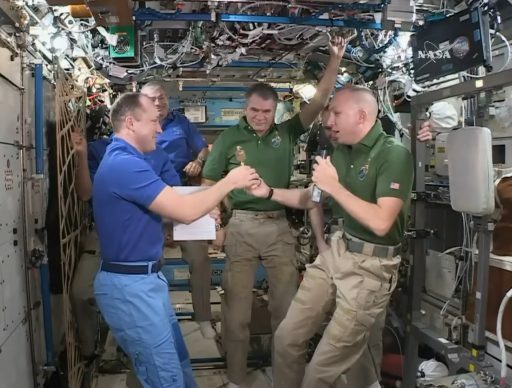 Arriving at ISS six hours after launch, second-time Soyuz fliers Sergey Ryazanskiy and Paolo Nespoli along with Space Shuttle veteran Randy Bresnik were welcomed by the Expedition 52 crew of Fyodor Yurchikhin, Peggy Whitson and Jack Fischer for a month-long handover. The six-member Expedition 52 crew supported the arrival of the Dragon SpX-12 cargo spacecraft and Yurchikhin and Ryazansky stepped outside on August 17 for a spacewalk dedicated to the release of CubeSats and the installation of experiments outside the Russian ISS segment. Whitson who had spent over ten months in space and her landing crew mates Yurchikhin and Fischer bid farewell on September 3rd. 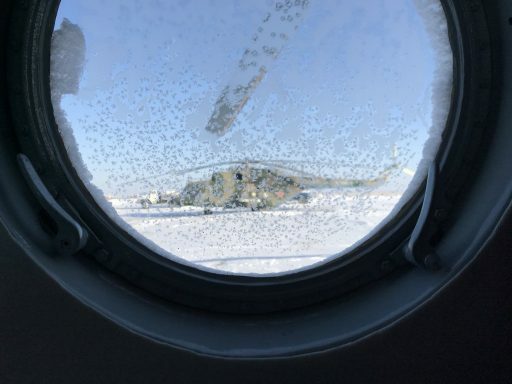 Transitioning into Expedition 53, ISS Commander Randy Bresnik and his Flight Engineers had ISS to themselves for ten days before Aleksandr Misurkin, Mark Vande Hei and Joe Acaba arrived aboard Soyuz MS-06. 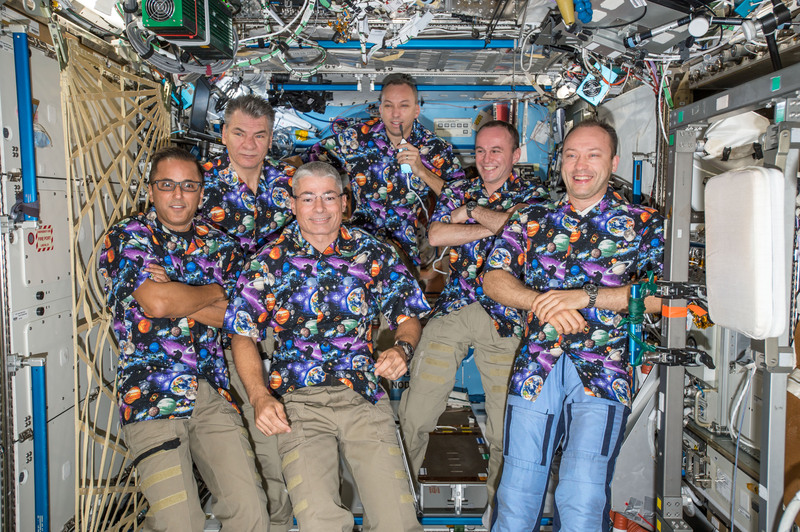 The crew primarily focused on over 300 active studies aboard the orbiting laboratory, in part enabled by the addition of a fourth U.S. 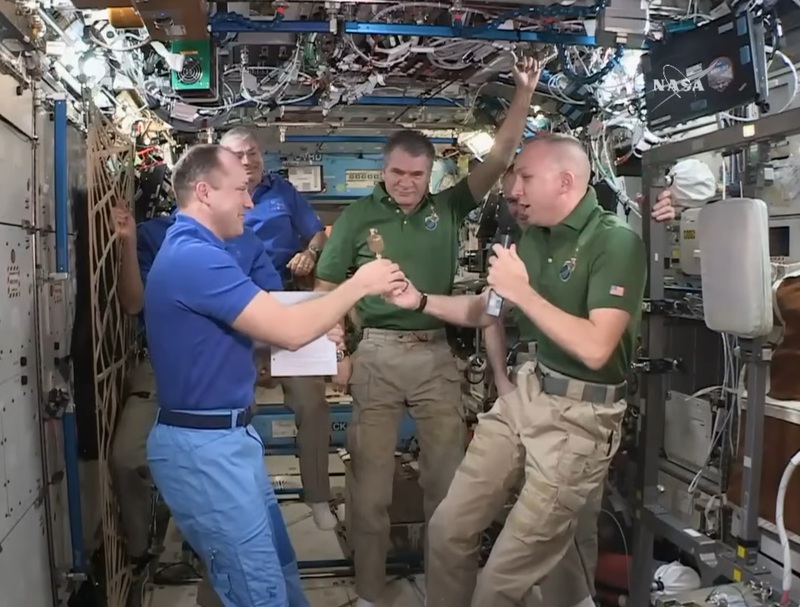 Segment crew member after Russia reduced its permanent ISS crew to two. Three spacewalks were carried out in October – Randy Bresnik was the lead spacewalker for all three and was joined by Vande Hei for the first two and by Acaba for the third excursion. These spacewalks were primarily dedicated to the replacement of one of two Latching End Effectors on the Station’s Canadarm2 and some external outfitting tasks including the installation of HD cameras and preparatory steps for future equipment replacements. With the mission of Soyuz MS-05 approaching its end, Ryazanskiy, Bresnik and Nespoli began stepping up their daily exercise sessions to prepare for the return to gravity while the Soyuz spacecraft completed a series of mandatory checkouts including a thruster test to ensure the craft is ready to fly on its own again after spending over four months at ISS. 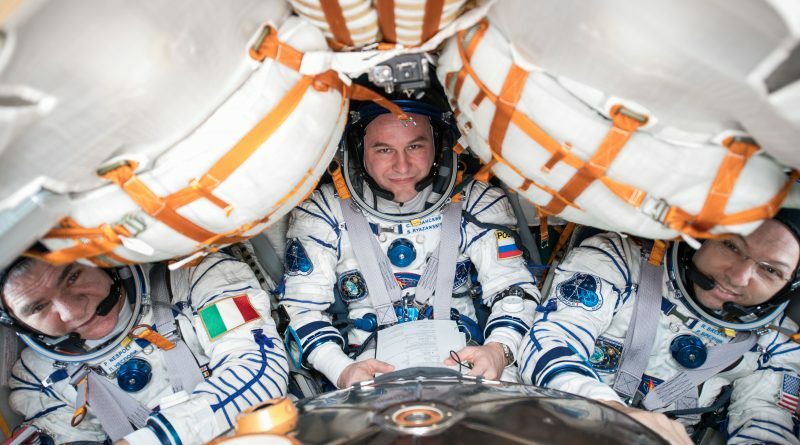 The three crew members completed leak checks of their Sokol launch and entry suits and verified a good fit of their seats inside the Soyuz that will be tasked with absorbing some of the shock at touchdown. 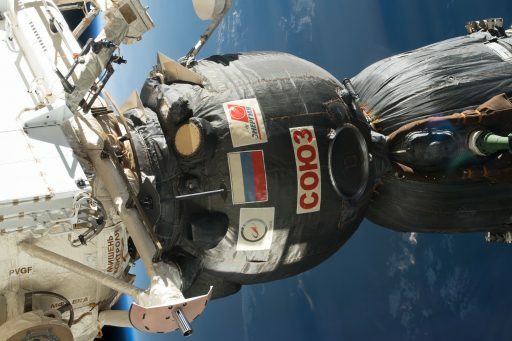 Procedure reviews for landing scenarios in nominal and contingency modes were also on tap for the crew and they began packing return items into the Soyuz Entry Module while loading the Orbital Module with disposal items. 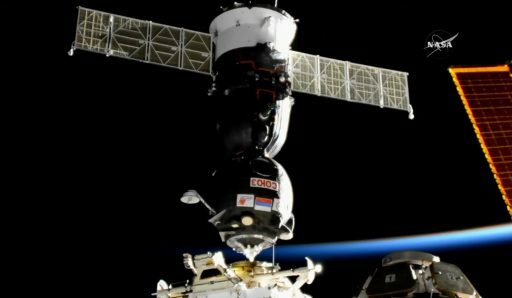 External surveys of the Soyuz took advantage of the HD still and video cameras installed outside ISS starting in 2016, providing close-up views of areas of interest for visual confirmation of vehicle health. 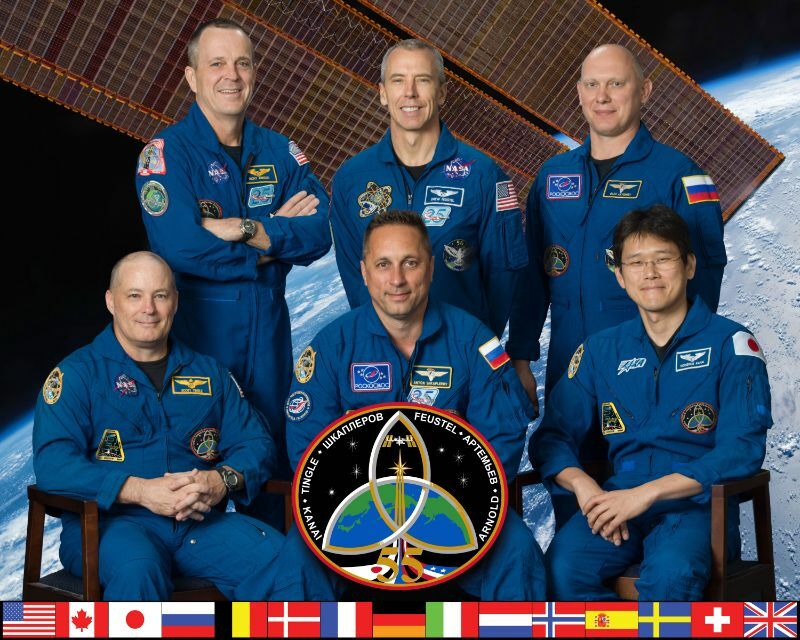 The six members of ISS Expedition 53 gathered Wednesday morning for the traditional change of command ceremony as Randy Bresnik handed the reigns over ISS to veteran Cosmonaut Aleksandr Misurkin who will lead Expedition 54 that formally starts at the moment Soyuz MS-05 departs the complex. It will only be a short period of three-crew operations for Misurkin, Vande Hei and Acaba as the next Soyuz spacecraft is already being integrated with its Soyuz FG launch vehicle, targeting liftoff from Baikonur on Sunday to bring Anton Shkaplerov, Scott Tingle and Norishige Kanai to ISS before the holidays. Squeezing between the launch and docking of Soyuz MS-07 will be the Dragon SpX-13 cargo spacecraft, provided its latest launch target of December 15 can hold after the mission suffered repeat delays this week. 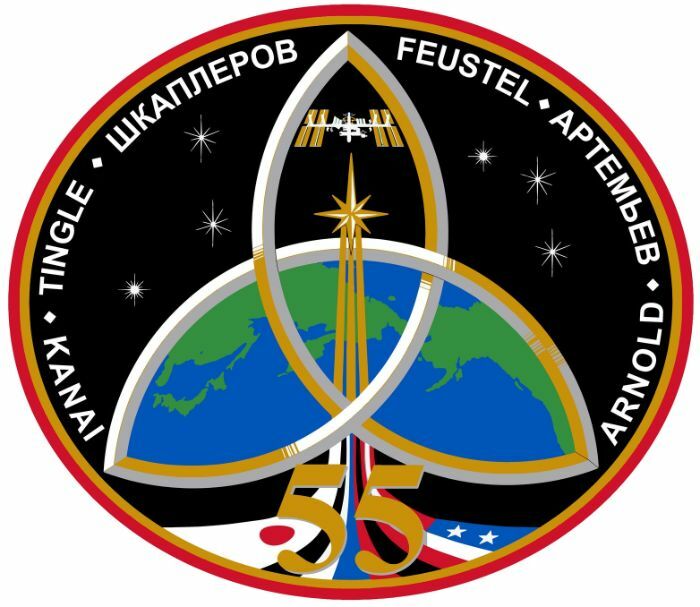 After the Change of Command Ceremony, the six Expedition 53 crew members will be able to enjoy several hours of rest before final return preparations begin for the Soyuz MS-05 trio – starting with the activation of the Soyuz spacecraft, a final round of communication checks through Russian ground stations and an update to the entry timeline based on the latest trajectory update from Mission Control. Once hatches on both sides of the interface are closed, the crew will command the vestibule area between the Rassvet module and Soyuz to depressurize for an hour of leak checks. 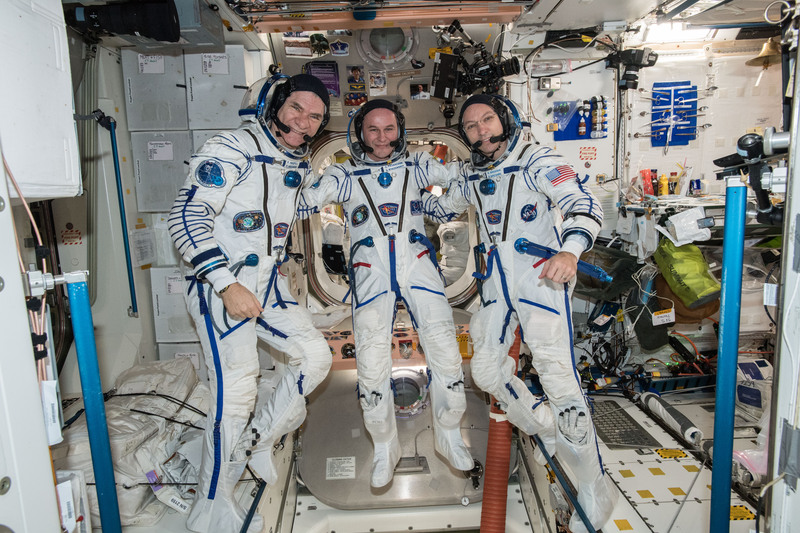 While keeping an eye on pressure measurements, the returning crew members will put on their Sokol Launch and Entry Suits and close out the Orbital Module by tying down loose items and deactivating systems. Taking their positions in the small Entry Module, Sergey Ryazanskiy will enter the center seat with Randy Bresnik to his left and Paolo Nespoli to the right with both Ryazanskiy and Nespoli gearing up for their second Soyuz landing and Bresnik preparing for his first return aboard Soyuz after completing his first spaceflight on the Space Shuttle. 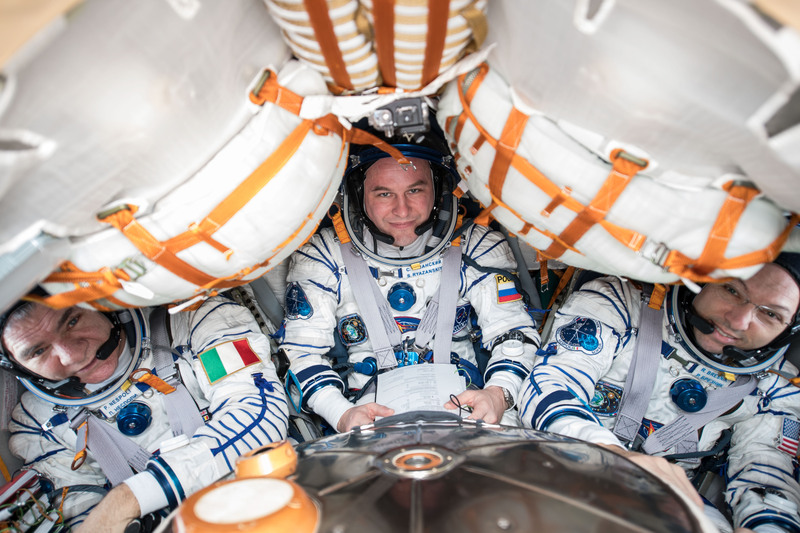 Once in their seats, the crew will complete leak checks on their suits, verify the integrity of the internal Soyuz hatch and press into final flight control system setup. Hooks on the Rassvet Module will open up well ahead of undocking so that Soyuz is only held in place by its own hooks. The docking mechanism will power up five minutes prior to undocking and the Space Station will move into a Fine Attitude Hold mode with thrusters disabled to be as still as possible for the demating sequence. The undocking command will be issued 90 seconds prior to the target undocking time of 5:14:30 UTC to enable the hooks to open and break the structural connection between Soyuz and ISS that was in place for over to 138 days. When hooks are open, loaded springs will push off ISS with 300 Kilogram-force, initiating a slow opening rate of 0.1 meter per second. Slowly drifting away from ISS, Soyuz MS-05 will enable active thruster control but remain in a passive state for two minutes to open up a sufficient gap for the separation burn expected two minutes after separation to increase the departure rate of the spacecraft. Departing the Station along the velocity vector, Soyuz will enter two and a half hours of free flight to open a gap of around 12 Kilometers prior to the deorbit burn. Soyuz will flip into a tail-first orientation and open up a protective cover shielding the SKD propulsion system to clear the way for ignition of the 300 Kilogram-force S5.80 main engine at 07:44:59 UTC on a burn of 4 minutes and 40 seconds. With the Orbital and Service Modules on their way toward a destructive entry, the Entry Module will fire up its thrusters to face its heat shield forward in preparation for Entry Interface at 08:15:07 UTC as it descends through 100 Kilometers over the border of Iraq and Iran – starting the 23-minute process of slowing down from 7.6 Kilometers per second to a complete stop. Blazing through the atmosphere, Soyuz will be immersed in plasma with its windows glowing bright yellow and the heat shield slowly burning away to fulfill its function by creating a boundary layer between the spacecraft and the extremely hot shockwave layer of crushed air in front of the capsule. Emerging from the plasma, the crew will pull up to five Gs when passing through 33 Kilometers in altitude, decelerating rapidly toward the planned parachute opening point. Soyuz slows to a speed of around 218 meters per second for the opening of the parachutes 10.8 Kilometers in altitude – starting with a pair of Pilot Chutes that are ejected to pull out the larger Drogue Chute tasked with slowing the vehicle from 0.7 times the speed of sound to around 80 meters per second. As Soyuz passes 7.5 Kilometers in altitude, the large orange-and-white main chute will unfold to further slow the spacecraft and put it into a vertical descent toward the landing point. Touchdown is expected at 8:38:28 UTC in the Southern Landing Zone located 147 Kilometers south-east of the town of Zhezkazgan. Recovery forces in helicopters and ground-based vehicles will begin descending on the landing site to assist the returned crew members out of their capsule to be then seated in reclining chairs or directly enter a medical tent depending on the weather conditions at the landing site.